Love the Elephant! This Saturday! 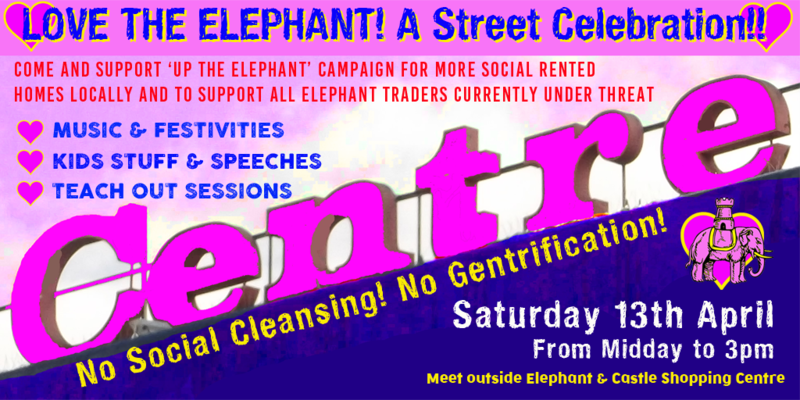 Join Southwark Notes, Latin Elephant and Up the Elephant to celebrate our precious community at Elephant and Castle and keep up the pressure for fair treatment for all our lovely traders who face displacement and eviction. Love the Elephant street celebration! 12:00-1pm – Music and festivities including a short Love the Elephant procession to the shopping centre for a public display of support. Bring your DIY placards and flags please! Just thirty-six independent traders from the Elephant & Castle shopping centre have been allocated new space in which to trade, in the event of the centre’s demolition and redevelopment. Despite concerns raised by the Chair of the ‘Traders Panel’ and his fellow panel member, the figure is trumpeted in a self-congratulatory press-release from Southwark Council and belies the true situation which is that at least 40 traders have been left out in the cold, according to Latin Elephant, who champion the cause of all independant ethnic minority traders. Southwark News reported that 28 applications for space were rejected. The new spaces are a mixture of permanent affordable units, at the base of the Elephant One Tower and on the ground floor of Perronet House (the ‘Elephant Arcade’), and temporary affordable units in Castle Square. Noticeably absent from the relocation sites are the affordable retail units on Elephant Park, formerly the Heygate estate. At over 1300 sqm, with circa 800sqm available in 2019, this is by far the largest of the four sites presented to Southwark’s planning committee as alternatives for displaced traders. This 800sqm of affordable retail comprises 8 units all located on one street (Sayer St), pictured in the CGI below (extracted from Lendlease’s marketing brochure). Unlike the other 3 sites, Elephant Park is under Lendlease control, not Delancey or Southwark, so the suspicion is that they have no desire to help Delancey, or Southwark, relocate traders, notwithstanding the ‘imagination, empathy and dedication’ it claims to be bringing to the Elephant & Castle. The CGI image above and marketing image below suggest that Lendlease’s vision doesn’t aim to include the likes of Jenny’s Burgers or the Sundial Cafe. A relocation strategy that only to relocates half of those who need relocation is a failure by any measure, more so when that failure is entirely predictable. Objectors, led by Latin Elephant, have consistently pointed out that Delancey’s half-hearted and dilatory ‘strategy’ simply did not provide enough space to accommodate all the traders who wish to stay at the Elephant and this has remainded the case, even as the number of traders has inevitably changed over time. In the summer of 2017 Southwark estimated that there were about 130 independent businesses, occupying 4005sqm within the ‘red-line’ of the development (excluding the Hannibal House office space). Latin Elephant calculated that all available space, including Elephant Park (East St market spaces, nearly a mile down the road), could accommodate 84 businesses on 2,263 sqm – not much more than half the floorspace required and leaving at least 38 eligible buinesses out in the cold. In March 2018, Latin Elephant objected to Delancey’s planning application, on the grounds that the amount of affordable retail space fell far short of the 4000 sqm needed. Nonetheless, the officer’s report for the application, lumped the new shopping centre’s affordable retail with the affordable retail of Elephant One and Elephant Park. The report noted that over a third of that space would not be completed until 2024, but nonetheless reached the comforting concluson that the total of 3866 sqm was ‘only marginally short…of the 4,005sqm of space currently occupied by independent retailers on the east (shopping centre) site’ (para 221). By January 2019, Perronet House had been approved and Castle Square itself went to planning committee, so the officer’s report for this wisely drops any reference to the shopping centre, to reach an affordable retail total of 2,859sqm. The report acknowledges that ‘whilst this would be less than the 4,005sqm currently understood to be occupied by independent businesses on the east site, some businesses may be able to operate from smaller premises’ (para 57). Southwark now identified 80 businesses in the redline and gave verbal assurances that there ‘should be sufficient’ units to accommodate everyone. In an FOI response in March 2019 Southwark gave the number of traders as 79 (an underestimate that treats the several businesses in Arch 7 as one). While Southwark’s approach to relocating centre traders can be characterised as wishful thinking, Delancey’s can be characterised as indifference. It’s starting position was that providing affordable retail ‘would be unviable and inapproriate’ (para 4.63) and that a relocation strategy would only be forthcoming, once Delancey had secured planning approval (an aim it acheived). Only the concerted efforts of local campaigners and councillors has dragged concessions from Delancey, including Castle Square, a relocation fund, as well as the affordable retail units, but more is needed. Traders must be given more space for relocation and securer leases; the centre itself needs urgent maintenance and promotion, so that businesses remain viable. The relocation fund of £634,700 is not enough to for the number of traders who need its help. In the meantime, it’s not too late to put a stop to this disastrous and inequitable scheme. The application for a judicial review of the shopping centre planning permission continues its legal progress. We want the permission quashed, for a scheme with more social rented housing and a better deal for traders. You can find out more about the legal challenge here and you can help fund our fight by donating here. Posted in Advice & Information, Neighbourhood Development, Southwark Plan. “We are monitoring events in New Zealand closely and send our condolences to all those affected. Our international network of UK counter terrorism officers will be ready to support our counterparts in New Zealand in responding to and investigating this appalling attack. “We stand together with all our communities and partners here in the UK and overseas, and will continue to work with them to counter the threat no matter where it comes from. Together with our intelligence partners we continually monitor the varied threats we face, including to and around places of worship and specific communities across the country, to ensure we have the most appropriate protective security measures in place to keep people safe. 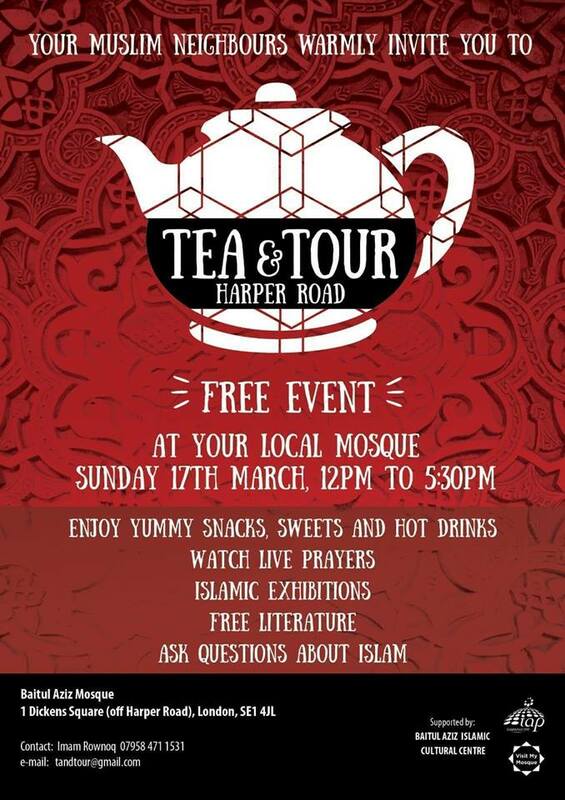 “Today we will be stepping up reassurance patrols around mosques and increasing engagement with communities of all faith, giving advice on how people and places can protect themselves. “Places of worship can also utilise our online training package ‘ACT Awareness eLearning’ for advice on Protective Security and how to react should the worst happen. It can be found at https://www.gov.uk/government/news/act-awareness-elearning. We’d also encourage everyone to be aware of our Run, Hide, Tell advice. Officers from Central South BCU will be providing extra reassurance patrols at key locations over the course of the day. Doubtless, members of the public will be shocked and very concerned at this terrorist outrage but at the current time we have no information or intelligence to suggest this is anything other than an extremely tragic but isolated incident. The MPS is committed to making London the safest global city and we continue to take a zero tolerance approach to hate crime. If members of the community have concerns then please contact your local Neighbourhood police teams or in cases of urgency dial 999. We stand together with the community in tackling extremism and hate in all its guises. Pease do contact my staff office or me if you have any questions or wish to discuss any further aspect of this incident with me. Are you a leaseholder with a complex issue with the council that has not been resolved? MySouthwark Homeowners Agency (MSHO) advocacy service can help you find a resolution to a range of problems where a resolution has not yet been found. Watch our video to see how other homeowners have benefited from this service. 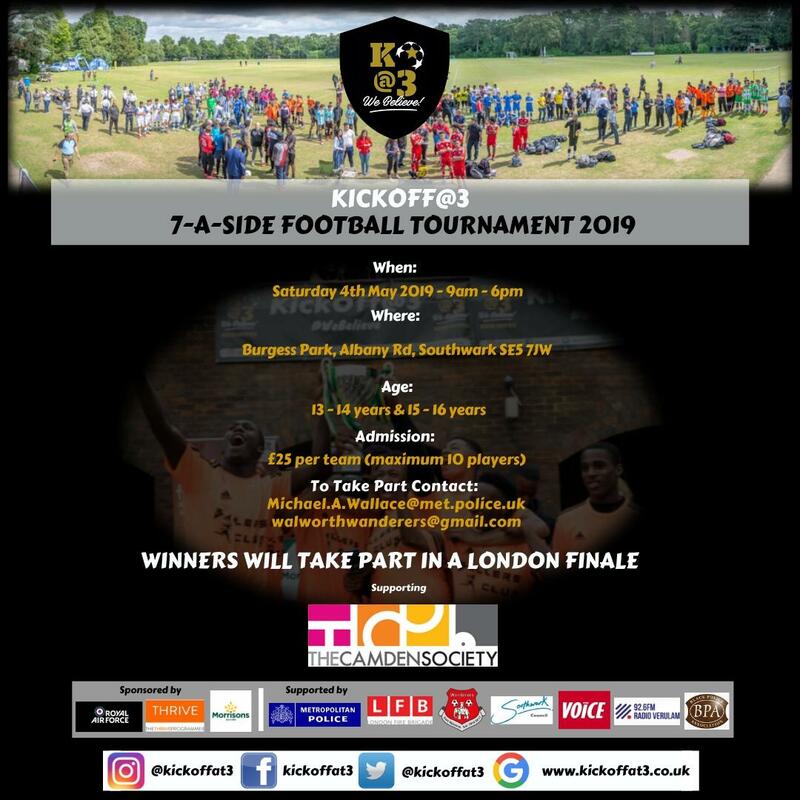 Kicks – Do you know of youths for a team? We are now very close to launching our CrowdJustice appeal for funds to quash the Elephant shopping centre planning approval. We have had two great fundraising events, with the Distriandina Party and the Film Night. We have now set a target of £5000 for our CrowdJusticecrowdfunding appeal. CAN YOU MAKE A DONATION? Can you get help us off to a flying start? Can you make a donation on the first day of our appeal on TUES 5 MARCH 2019? We then have only 30 days to reach our target of £5000. If we can raise a good chunk of this in the first couple of days it will encourage others to donate. The donation can be any amount – all are welcome, big or small! Delancey want to build nearly a thousand new homes, but only 116 will be social rented – and we will have to wait nearly ten years to get them. Delancey may even get away with providing no social rented housing at all. We think this is wrong and that is why we are going to court to try to overturn the permission. We want at least 42 more social rented homes and we know the Mayor has the money to pay for them. We want a better deal for shopping centre traders – a bigger relocation fund and lower rents. Our community deserves a development scheme that provides homes and shops that are truly affordable for local people, not one that short-changes us. Please share the our CrowdJustice link with your friends too! Posted in Advice & Information, Events, Neighbourhood Development, Southwark Plan.